In this stunning photograph, the priest has just thrown the cross into the sea and youths scramble in the surf for the honor of retrieving it first. On the boats to the right, two or three strapping young lads prepare to join the fray – most went in fully clothed. The Orthodox Christian holiday of Theophany, also known as the Epiphany, the Celebration of the Lights, or simply ta Fota (the Lights), held every January 6, is the third and final major feast day of the holiday period. Along with St John’s Day, observed the following day, the Epiphany ends the Christmas period in the most festive and symbolic of ways. According to three of the four gospels – not including St John’s – Theophany (literally “God shining forth”) celebrates the revelation of God when, during the baptism of his Son by John the Baptist at the Jordan River, the voice of God is heard declaring from heaven: “You are my Son, the Beloved; with you I am well pleased.” Besides the revelation of God, this is also the moment when the triune divine presence known as the Holy Trinity, came into being; in addition to God and his Son, the Holy Spirit was present, too, arriving in the form of a dove. The revelation of the triune God also provides the common name ta Fota (the lights) given to this major feast day in Christianity, celebrated in the East and West by Christians of all denominations [in the Western Christian tradition, the holiday focuses more on the visit of the Magi ((three) Kings or (three) Wise Men) to the child Jesus]. In the Orthodox Church, this is the day when all of creation is illuminated by the sanctifying presence of God. The day also symbolizes Holy Water and the consecration of the waters, a clear reference to the cleansing of Jesus in the waters of the Jordan River. It is no coincidence, then, that Theophany, along with Easter, is the oldest Christian celebration, given the deep symbolism involved with this holiday. The actual day, and its eve, are marked in a variety of ways by many different ceremonies held throughout Greece. On the eve of Epiphany, the feast day is heralded by children singing kalanta (carols). They take the message of Jesus’ baptism in the Jordan River from house to house. At churches, the service of the Lesser Sanctification of Water (Mikros Agiasmos) is celebrated. Priests then take the sanctified water around to individual homes and sprinkle and bless both the structures and their inhabitants. The actual feast day begins with services of rejoicing at churches before continuing with the service of the Great Sanctification of Water. Then, processions comprised of clergy, local authorities and worshipers head to the nearest body of water – sea, lake, river, even water depots – where a ceremony is held to bless the water. This blessing is confirmed when the priest casts a cross into the water and a dove that symbolizes the Holy Spirit is released. Young men dive into the water to retrieve the cross, and the individual who recovers it and returns it to the priest is given a special blessing, believed to provide greater luck for the year ahead. 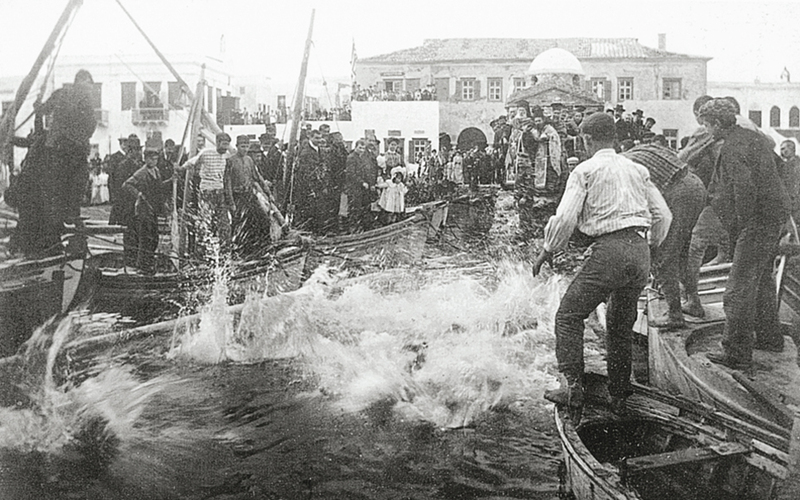 The official national ceremony for the Blessing of the Waters is held every year in Piraeus, Greece’s main port, with top-ranking church officials and the country’s political leadership in attendance, but the equivalent ceremonies staged in cities, towns and villages throughout Greece, while possessing unique elements of their own, are no less devout, observant of ritual or enjoyable – albeit always within the context of religious ceremony. It should be pointed out that many of Greece’s traditional events and celebrations, preserved throughout its long history, have been harmoniously linked to the present, both on the mainland and on the country’s picturesque islands, creating occasions of special meaning and beauty.